The Kentucky Derby is probably the last place you’d expect to find a young black fashion and beauty journalist, yet that’s exactly where I found myself this past weekend. And while my southern upbringing (I’m a born-and-raised Texan gal) is the reason the Derby has always been on my bucket list, I’ve always been fully aware that the elite and lily-white sporting event isn’t really for me — for us. My invitation to the grand horse race came courtesy of one of its official sponsors, luxury watchmakers Longines. And aside from figuring out what to wear, I was curious as to how many black people would be in attendance. I remember watching the annual event on TV with my family over the years, and I never recalled seeing black people there. So was I going to be left trying to fit in with what I presumed to be a crowd of rich, preppy white folks? Not that I think that black people need to attend sporting events in order for me to fit in, but it would be nice to see my people representing while I’m there –that’s all. Thankfully I was pleasantly surprised. And although there wasn’t a significant number of black folk seated in the grand stands or higher sections of the stadium (read: the expensive seats), the ones I did spot were dressed to kill. Fashion plays a major role at the Kentucky Derby. The event might be more famous for the attendees rocking their over-the-top hats than it is for its lightning fast horses. The majority of these hats are big, bold, beautiful spectacles all to themselves. While I was pretty impressed with my moderately priced black fascinator, I found myself shrinking in shame after noticing the lavish pieces of art that adorned all of the womens’ heads. Longines hosted a fashion show Friday and I sat there in awe as the women strutting down the red carpet in the most terrific toppers I’d ever seen. There was one shaped like a bird’s wings, another that featured mirrors and even another that was made out of feathers. The men get into the fashion festivities too. I noticed one gentleman donning a hat that featured a spinning merry-go-round of horse — and another with horses standing in stalls adorned in roses. I made it a point to chat with several people of color about the Derby’s unique style and how they interpret their own swag into the festivities. 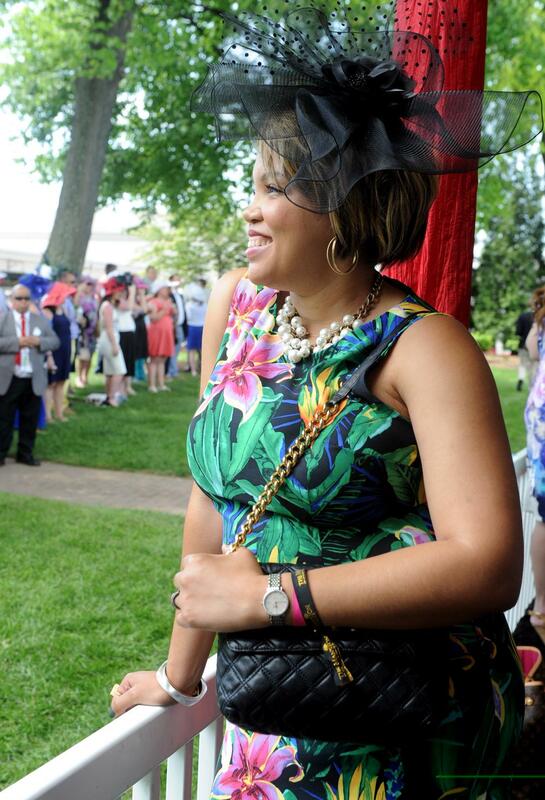 Even Mis Kentrucky, Clark Janell Davis of Louisville, Kentucky echoed those sentiments regarding the excitement surrounding style at the Derby. Eden Bridgeman of Columbus, Ohio, says that the Derby is the best sporting event ever. “Everyone here is dressed to the nines, it’s fun and people of every walk of life can be a part of it,” she said. Bridgeman, who wore a fabulous blue hat designed by Loretta Persetti, said that historically black people have always attended the Derby and are now becoming more prominent. In fact, the Derby is steeped in black history. African American jockeys played a huge role in the history of the Kentucky Derby. In fact, according to KentuckyDerby.com, at least 13 of the 15 riders in the first Derby were African American and African American reinsmen have won 15 of the Derby’s first 28 runnings. “[Black people] have always been a part of it and the Derby has now become such an international affair that you’re able to see not only African Americans but every ethnicity,” she said. However, from where I was seated in the super swanky, high recesses of The Mansion — a V.I. P area– there weren’t very many black people around. In fact, I didn’t notice any until I descended into the lower parts of Churchill Downs. But, this is something that Ulysses “Junior” Bridgeman, President of Bridgeman Foods, LLC and a board member of the Churchill Downs, said he plans to change. While I can certainly attest to this truth as I did manage to collect tons of business cards by the end of the event, Bridgeman noted that most black people might not know this. Whatever the case may be, Bridgeman forecasts that more black people will be attending in the future. And this is a vision that Star Jones, who is currently President of the Professional Diversity Network and the National Association of Professional Women, shares as well. Jones, who noted that this is her ninth year attending the Derby, said that she thinks Bridgeman is doing a magnificent job. “He’s one of the reasons that I’m here every year,” she said. Well, after the fashions, of course. “First of all, here, you know it’s all about the hat, but also you just need a very ladylike dress with some pastels and some florals and you can do the Derby,” she said. Nevertheless, Bridgeman says that he wants people to get away from color lines when it comes to attending the Derby.